@sr121: What can female non-unionized workers do to minimize the gap? Women who have a union contract don't have to worry about their male peers making significantly more than they do. For most women who don't have the benefit of a union contract, it can be intimidating to ask their boss for information around pay and compensation in the workplace. Women can face this challenge more effectively if they join together with a common voice to speak out for their rights on the job. Even something as simple as taking a woman colleague with you when you talk to you boss about your salary can ease some of the anxiety. Also, be confident in your worth! That is part of the battle for women. We don't always know that the guy working next to us is making more money, just like Lily Ledbetter. Sharpening your negotiation skills with a friend through role play can be helpful. @sr121: Also, did you like Lean In? I agreed with the principles and it definitely got the conversation going to have a woman like Sheryl Sandberg elevating the dialogue. It was very centered around professional women and left out a whole swath of working women who don't have the same luxuries and privileges. For a woman working as a server in a restaurant or a nurse in a hospital, the idea of Leaning In isn't as tangible. To those who may be struggling in their workplaces, I would say, "Lean In" but lean in collectively to leverage your strength. It's much safer. @grayson.kennedy: What is the AFL-CIO doing to reach younger women on pay equality? Is digital media a major part of your outreach efforts? Absolutely! Young working women are shouldering more economic challenges than previous generations. Unemployment for young people is higher than the overall rate and they are being weighed down by mounds of student debt, coupled with the lack of good job opportunities that pay a decent wage and provide good benefits. The labor movement recognizes that engaging and mobilizing young people, especially women, is critical which is why we have our Next Up program. It specializes in providing leadership opportunities for young people and has created a network of grassroots young worker groups to address the economic issues and be a force for change at the local level. And for young working women, we are pushing our #equalpayequalsay initiative digitally and we will use it as a focal point for our 2016 election activity. @cameronpig: I read women are less likely to ask for a raise. And this is often a reason as to why they are less likely to receive them. What can women and employers do to combat this issue? It seems a little blame shifting, if you ask me. This speaks to our unequal office culture overall. There are fewer women in the c-suite and positions of leadership so women lack visible role models on the job. Without that reference point, many women lack the confidence to ask for a raise even if it is well deserved. To combat this issue, employers can be more aware of who they promote and the reasons behind it and offer transparency in the office. Women can build support networks to help with negotiation skills. If you need any negotiation tips, ask a union woman we are pros! 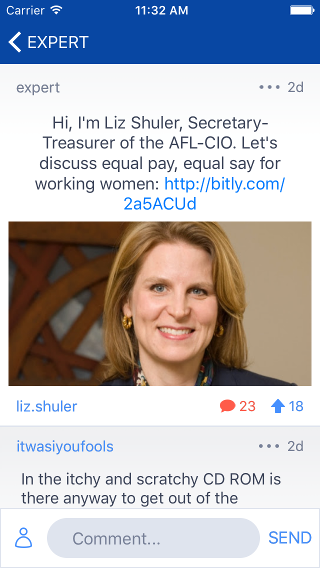 @liz.shuler: Thank you so much for chatting with me about Equal Pay. We have a lot of work to do and I look forward to seeing what we can accomplish together!